Monatschrift fur die geschichtliche und experimentale Begrundung der ubersinnlichen Weltanschauung auf monistischer Grundlage. 1/1, January 1886-22/124, June 1896. 84 pp. Illustrated. Hubbe-Schleiden (1846-1916) was a world traveler and an advocate of German imperialist and colonialist ambitions. He became a Theosophist in 1884 when H.P. Blavatsky visited Germany and received a letter (mysteriously precipitated out of thin air) from a Mahatma. 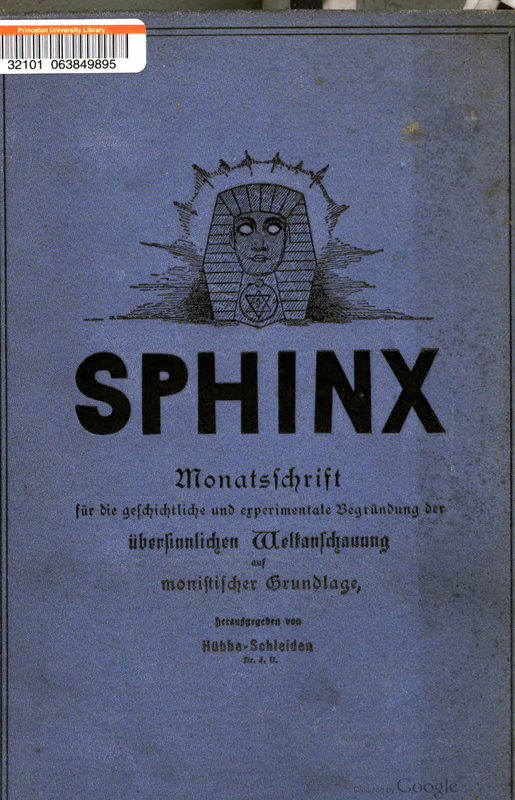 Though Hubbe-Schleiden was a Theosophist and Der Sphinx became in turn the organ of his Theosophische Vereinigung (1893) and of the Deutsche Theosophische Gesellschaft (1894), the scope of the journal was wider than Theosophy and Der Sphinx carried contributions from a wide selection of psychical researchers and others, including articles by Carl Kiesewetter (the famous series on the Rosicrucians), "Theodor Regens" (Theodor Reuss, on "Pranatherapie"), Carl du Prel (1839-1899), Gustav Meyrinck, M.F. Sebaldt, Eduard von Hartmann, Ernest Haeckel, Lazar von Hellenbach, and Max Dessoir (1867-1947), including his seminal "Die Parapsychologie." It also republished "Das Lebens-Elixir" by "Murad Ali Beg" originally published in H.P. Blavatsky's The Theosophist. The author, "Mirza Murad Ali Beg," is Godolphin Mitford, who played a fascinating role in Theosophy in the early 1880s in India. Article Index: The complete table of contents, compiled by Robert L. Hutwohl, is online at The Theosophical Society in Australia.